My 13 year old son, who is a black belt in Kyokushin Kai Karate, has been learning Krav Maga. He reported that today in school, some kids were messing around in the hallway. He tried to pass saying, “Excuse me,” and one of the kids put him in a headlock. Since we have been drilling the counter to the headlock, he got right out of it, but did not beat the kid up. Good to have some confirmation from time to time that this stuff works! Well now that I pointed out the books that will get you killed, here are the ones that WON’T. Keep in mind that there is no guarantee, and the best defense is always the NIKE defense: RUN! 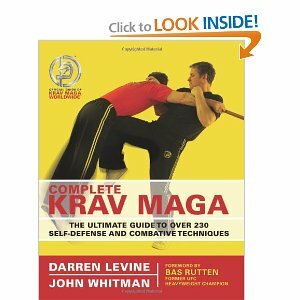 This book, Complete Krav Maga: The Ultimate Guide to Over 230 Self-Defense and Combative Techniques by Darren Levine is good if you are looking for an illustrated guide to techniques. I own this book and refer to it often. It is hard to learn techniques solely from a book, but it is not impossible. Of course you need a partner to drill these with. Meditations on Violence: A Comparison of Martial Arts Training & Real World Violence, written by Sgt. Rory Miller, a corrections officer from the Portland , Oregon area is not a technique based book, but gives some philosophy and a wake up call to people who have been taking traditional martial arts and have been doing things like point sparring and non-contact drills, to let them know that what they have been practicing is probably worse than useless, because in addition to getting you killed, it give you a false sense of security. Strong on Defense by Sandford Strong a retired San Diego cop, details what actually happened in violent encounters, and points what victims did right and wrong. This book looks into the psychological aspects of preparation and more importantly, avoidance. The Gift of Fear and Other Survival Signals that Protect Us From Violence by Gavin de Becker, a renowned security consultant, urges women to trust their sixth sense, because when it comes to danger, it is usually right. That uneasy feeling you have is telling you something, so listen to it. So now that I have given you my recommended Self-Defense reading list, I’m thinking I need to re-read all these books! I stumbled onto this sarcastic post, 5 Self-Defense Books for Women (Who Want to Lose a Fight) (caution explicit language) on Cracked.com. Pretty humorous, and it reminded me of this book, Fighting Back: Taekwondo for Women. I actually took Fighting Back out of the library and skimmed it. It is full of deadly advice. There are numerous posed pictures of women supposedly defending themselves from male attackers. Perhaps the worst advice is right on the cover, a women doing a high kick against a male attacker. In Krav Maga, we teach never to kick above the floating rib (that’s the lowest one). And even that move can be dangerous. I learned a technique from one of my teachers, (Soshu Shigeru Oyama, Kyokushin great and founder of World Oyama Karate) , where you catch a rib height roundhouse kick, while stepping away from it, and kicking out the supporting leg. This move is pretty effective, and is a great counter and take down. The safest advice is only kick below the waist (that’s if you can’t just run away in the first place). One photo in Fighting Back has a pretty women in a mini skirt, with teased up 80’s hair, kicking to a man’s face. I was turned on just looking at the photo! What could happen is that the kicking leg is caught, the women get’s taken down, and the attacker goes right up her skirt. Not good. This book is supposed to prevent that. We worked on combos, punching only, followed by punching & kicking. Then we reviewed and drilled choke defenses to make them more instinctive. an armed attacker. 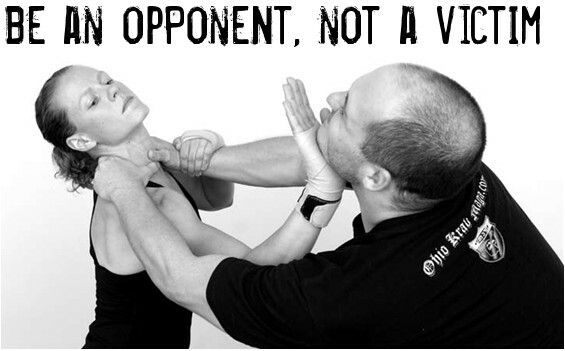 The Krav Maga system offers real world self defense designed to be easy to learn, easy to remember, and extremely effective. No prior training or experience is required. Taught by United States Krav Maga Association Black Belts John and Sue Burton. 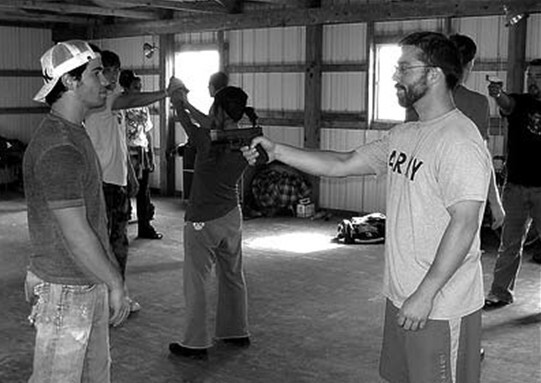 Learn battle-tested Krav Maga techniques for defending yourself and your loved ones. The Krav Maga system offers real world self defense designed to be easy to learn, easy to remember, and extremely effective. No prior training or experience is required.